I've made, if not a tradition, then at least a bit of a habit of reading ghost stories over Christmas. Having exhausted the more traditional fare in recent years I ended up with something not quite as cosy as the Dickens or James standards I normally get through, but technically a ghost story all the same. 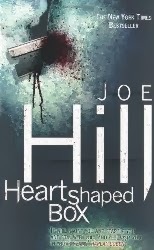 Joe Hill's Heartshaped Box has a very up-to-date premise, in which there's a ghost for sale on the internet: Jude, an ageing rock star with a fondness for collecting the gruesome and arcane sees the ultimate addition to his collection on an online auction site (for legal reasons it's made very clear that it's not eBay.) When he actually receives the package there is indeed a ghost in there, but instead of the docile old man he's been promised he gets the late stepfather of one of his ex-girlfriends, who thinks Jude mistreated his stepdaughter and wants revenge. I found this an interesting horror novel, a genre I don't really read that much of any more, and as well as doing the suspense elements well there's a satisfying nastiness to it as well. The ghost's true motivations aren't entirely hard to guess but it makes for a pretty grim turn to the story as well. Maybe not exactly festive, but then I do appreciate an antidote.